No. 951 is a 650 degree, electrically-heated, walk-in oven from Grieve, currently used for preheating large steel molds at the customer's facility. 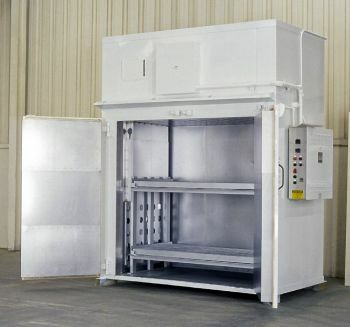 Workspace dimensions of this oven measure 72" W x 42" D x 72" H.
60KW are installed in Incoloy-sheathed tubular elements to heat the oven chamber, while a 4200 CFM, 3-HP re-circulating blower provides a combination airflow to the workload. This Grieve walk-in oven features 5" insulated walls, top-mounted heat chamber, aluminized interior and exterior plus a free-standing oven rack with two 6000 lb. capacity shelves for the workpieces. Controls on No. 951 include a digital indicating temperature controller, manual reset excess temperature controller with separate contactors and re-circulating blower airflow safety switch.